The Minnesota Vikings were 4-4 and coming off of two straight losses as they faced the Denver Broncos on November 14, 1993. Head Coach Dennis Green’s team had difficulty scoring and offensive coordinator Jack Burns was already a casualty. Brittle veteran QB Jim McMahon was injured and Sean Salisbury (pictured above) had taken over. A star for two years in the CFL, leading Winnipeg to a Grey Cup title, Salisbury had been strictly a backup in the NFL. The loss of RB Terry Allen for the year with a knee injury further hampered the offense. Denver was 5-3 and had just won two consecutive games. Under a new head coach in Wade Phillips, following twelve seasons with Dan Reeves at the helm, the key to the offense was still veteran QB John Elway, and he was thriving in offensive coordinator Jim Fassel’s West Coast offense. A morning snowstorm had dropped six inches of snow on Denver. While the field at Mile High Stadium was clear, footing was slippery and the temperature was around 30 degrees at kickoff. Minnesota had the first possession and punted, but Elway fumbled away his first snap, thus giving the Vikings an early break as they took possession at the Denver 34. Three plays later, Sean Salisbury threw to WR Anthony Carter but Carter, having broken a tackle, tripped and fell at the one yard line after gaining 27 yards. It proved to be significant on the next play when Salisbury fumbled while being sacked and LB Karl Mecklenburg recovered for the Broncos. Denver went three-and-out, but three plays after punting CB Frank Robinson intercepted a Salisbury pass and returned it 13 yards to give the Broncos possession at the Minnesota 31. Elway completed four passes as the home team scored in six plays that included a four-yard throw to WR Derek Russell for a touchdown. However, tackle Tim Irwin blocked the extra point attempt and the score remained 6-0. The Vikings responded by going 71 yards in seven plays. Following a nine-yard carry by eleventh-year RB Roger Craig to start off the series, Salisbury threw to Anthony Carter for 30 yards to get into Broncos territory. Two plays later he hit Carter again for 39 yards but the drive stalled at the Denver seven yard line and Minnesota settled for a 25-yard field goal by Fuad Reveiz. The Broncos led by a 6-3 score. Russell returned the ensuing kickoff 49 yards to give Denver good starting field position at the Minnesota 49. In a series that extended into the second quarter, the Broncos scored in seven plays as RB Robert Delpino ran for a three-yard TD. This time the extra point was successful and Denver’s lead was extended to ten points. Minnesota’s next possession ended with a fumble by RB Barry Word, forced by Mecklenburg, and once again the Broncos had the ball in good field position at the Vikings’ 37. Again they capitalized, driving methodically down the field in six plays that ended with Elway tossing a 13-yard scoring pass to WR Vance Johnson. Now down by 17 points midway through the second quarter, the Vikings came back on a series that was highlighted by Salisbury throwing to TE Steve Jordan for a 53-yard gain to the Denver 11. Two plays later Salisbury completed a nine-yard touchdown pass to WR Cris Carter. Following a Denver punt, the Vikings took possession at their 45 yard line with 1:39 left in the half. It took four plays to cover 55 yards as Salisbury threw to Cris Carter for 23 yards, Anthony Carter for 15, and Craig for a 17-yard touchdown. Going into halftime, Minnesota had narrowed Denver’s lead to 20-17. After a punt by the Broncos, Minnesota tied the game in its first series of the third quarter. However, it had seemed as though the Vikings would do more than that when Salisbury threw to Cris Carter for 26 yards and, following a pass interference penalty, they had first-and-goal on the Denver three. But two runs by Craig failed to reach the end zone and Salisbury tossed an incomplete pass. Minnesota ended up with a 19-yard Reveiz field goal. Elway came out throwing on Denver’s next series, but an apparent long completion to TE Shannon Sharpe was nullified by an illegal formation penalty and the Broncos ultimately had to punt. The Vikings had to kick it back and once more Elway passed the Broncos down the field, hitting Johnson for 17 yards and Russell for 30. However, after getting to the Minnesota nine, a 26-yard field goal try by Jason Elam was blocked by Irwin. As the game entered the fourth quarter, neither team was able to mount another threat until the Vikings took possession at the Denver 40 following a punt. They were able to drive into scoring position and Reveiz kicked a 35-yard field goal. But Denver responded in kind, going 45 yards in six plays that ended with Elam booting a field goal from 53 yards. The trading of three-pointers continued when the Vikings advanced to the Denver 25 on a series highlighted by a Salisbury pass to Cris Carter for 55 yards. Reveiz added a 43-yard field goal to put Minnesota back in front. With a little under three minutes left on the clock, Elway and the Broncos mounted another promising drive that was helped along by two defensive penalties. But RB Glyn Milburn’s fumble after catching a pass from Elway at the Minnesota 21 with 54 seconds left stopped the potential comeback in its tracks and sealed the 26-23 win for the Vikings. Minnesota led in total yards (427 to 342), with all but 70 of that total coming through the air. However, the Broncos had more first downs (25 to 18) and recorded four sacks to one of Elway by the Vikings. Denver also turned the ball over four times, to three suffered by Minnesota. There were 23 penalties in all, with 13 of those called on the Vikings. Sean Salisbury had an outstanding performance, completing 19 of 37 passes for 366 yards with two touchdowns and an interception. Cris Carter caught 6 of those throws for 134 yards and a TD while Anthony Carter contributed 111 yards on four receptions. Steve Jordan pulled in 6 passes for 85 yards. Roger Craig was the leading rusher with 41 yards on 14 carries. Tim Irwin (pictured below) blocked a short field goal and extra point, giving him eight blocked kicks thus far in his career. For the Broncos, John Elway was successful on 30 of 40 throws for 290 yards with two TDs and one interception. Shannon Sharpe caught 7 passes for 104 yards. Rod Bernstine gained 37 yards on 8 rushes and added 6 catches for another 37 yards. Glyn Milburn gained 30 yards on four attempts, caught 5 passes for 27 yards, and had another 116 yards returning kicks, but also had the critical fumble at the end. The Vikings lost their next two games but won four of their last five to finish second in the NFC Central with a 9-7 record and qualify for the playoffs as a Wild Card. They lost to the Giants in the first round. Denver also made it to the postseason with an identical 9-7 tally. The Broncos were a Wild Card entry as well, placing third in the AFC West, and lost to the division-rival Raiders in the initial round. 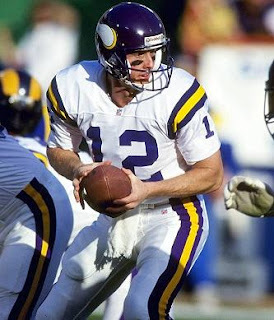 Sean Salisbury started a total of four games for the Vikings in 1993. Overall, he completed 115 of 195 passes (59 %) for 1413 yards with 9 touchdowns and 6 interceptions. The 366-yard passing performance against Denver was his NFL career high and the second of back-to-back 300-yard games. 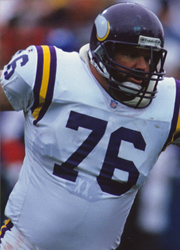 The ‘93 season proved to be the finale for Tim Irwin’s 13 years with the Vikings. He ended up with a total of 10 blocked kicks.